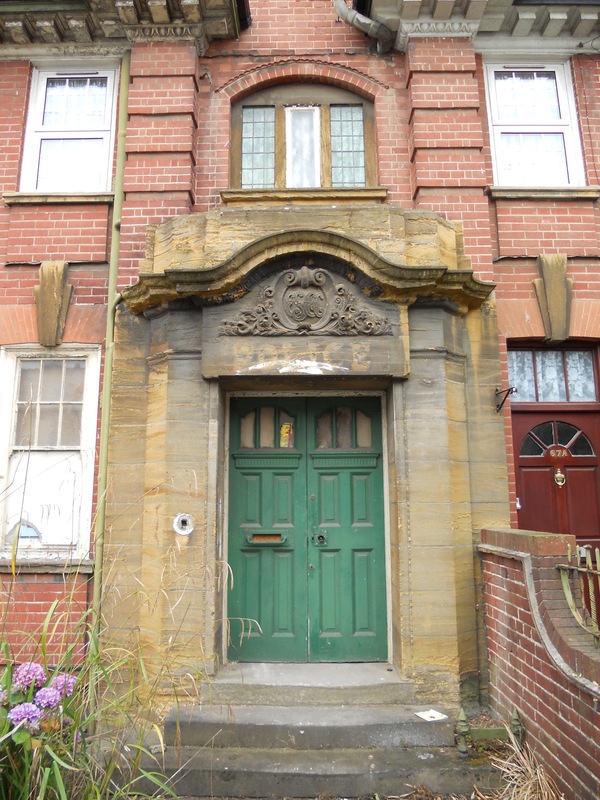 As a great supporter of historic Portslade, I was somewhat disappointed in myself when I discovered how little I knew about the town’s old police stations. Portslade’s newest police station, now sadly closed, is situated halfway along St. Andrew’s Road. It was built in around 1909 and is a most interesting structure due, in part, to its connected dwellings. The police station and, in particular, its sorry state, were brought to my attention by Frederick Andrews (Peter to his friends) who owns the first of the building’s associated residences, an imposing house attached to the east side of the main station building (No. 67). To confuse matters slightly, the main building cleverly incorporates the second residence, a large house (67A). A further two houses are attached to the west side of the building (67B and 67C). I understand that these four homes were specifically built for the police which is supported by the fact that Superintendent W. Suter and three constables were recorded as residents in 1919. A sandstone portico highlights the derelict building’s main entrance and the word ‘POLICE’ is spelt out by clean sections of stone which were once covered by lettering. Above is an interesting arched triptych window with two leaded lights (the third is missing!). Brick voussoir lintels grace the ground floor window openings where some of the original sashes are still in place. There were once stables at the rear of the site which is now home to a number of garages. The cells beneath the building were used as an air raid shelter during the Second World War and a decontamination chamber was added in case of gas attack. The first record of a constable in Portslade dates from 1576. The previous police station on North Street nearby was certainly in use by 1862. North Street runs parallel to St. Andrew’s Road and once served as a busy shopping hub. However, it’s now unrecognisable in its modern industrial guise. On the subject of change, Portslade’s town hall and fire station, on Church Road and Victoria Road respectively, are no longer used for their intended purposes. The fire station, at least, is in excellent condition following sympathetic conversion works. I wonder what, if anything, is planned for this charming building but why the delay? I’d be more than happy to take whoever is responsible for its neglect on an extended tour of the old cells. Brighton University’s Faculty of Art began as the Brighton School of Art in the Royal Pavilion in 1859, just over 150 years ago. To confuse maters somewhat, names along the way have included the ‘School of Art and Science’, the ‘Municipal School of Art’, the ‘College of Arts and Crafts’, the ‘Faculty of Art and Design’ and the ‘Faculty of Arts and Architecture’! The Faculty’s Grand Parade Campus is surprisingly spacious and very central. It was built in a contrasting style to the art school which previously occupied the site – concrete and glass as opposed to brick and Bath stone – and was opened in 1967 by Sir Walter Thomas Monnington, President of the Royal Academy. 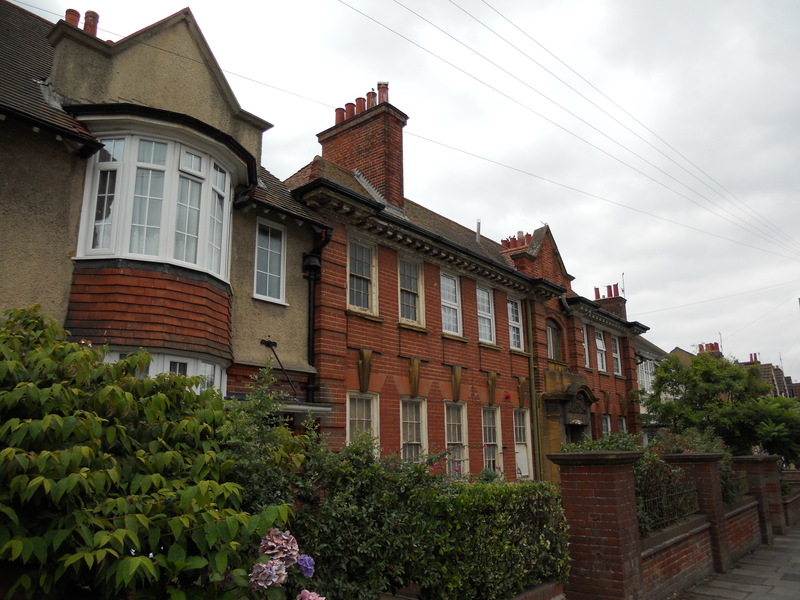 The principal architect was Borough Surveyor Percy Billington and his contribution turned out to be one of just a handful of decent local buildings from that period. 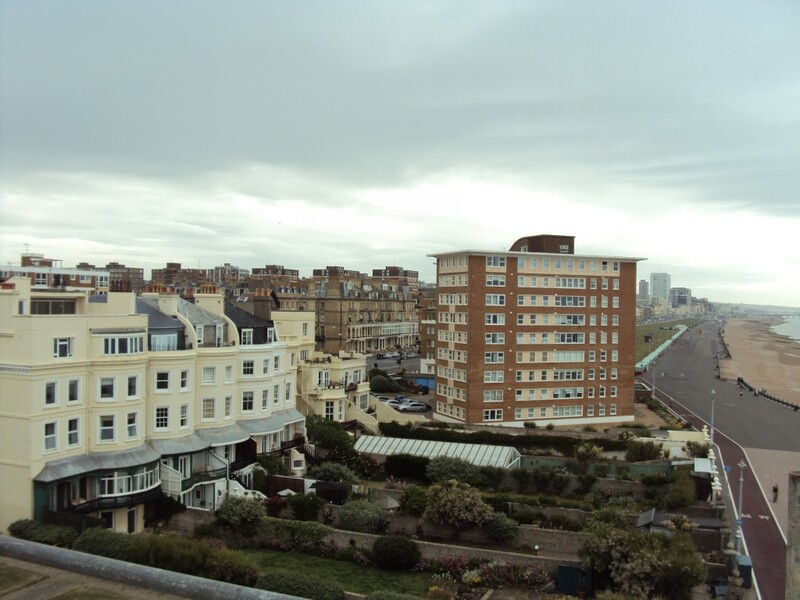 Dr Anthony Seldon places it within his top ten 20th century buildings of Brighton & Hove in his book Brave New City. My own (very short) list of favourite buildings from the 1960s and 70s includes Eaton Manor, Park Gate and, of course, the University of Sussex – but that’s about it. Incidentally, Billington was also responsible for the police station on John Street just around the corner. I recently met with architect Ian McKay from BBM, the Lewes-based sustainable design specialists, to look at a series of additions to the building completed by his firm in 2007. Inspiration came from Raphael’s School of Athens, a painting which brought together Aristotle, Plato and other great philosophers. One of the new areas was a single storey extension which was constructed over a section of the popular courtyard. Quite rightly, no space was lost as it features a large roof terrace which overlooks the valuable green space below. 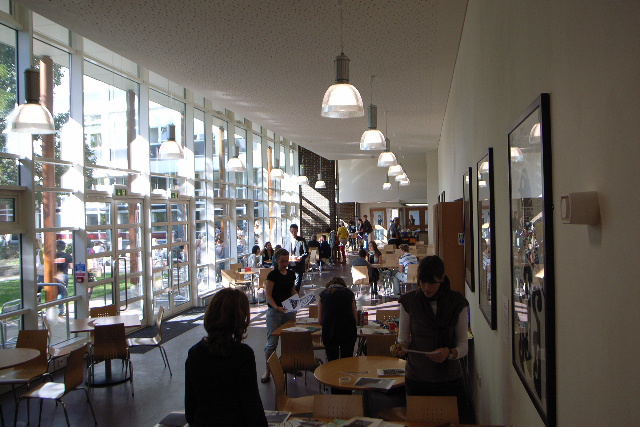 Another of the additions was a café with an acoustic ceiling behind the Sallis Benny Theatre. The theatre, incidentally, takes its name from Mr E. A. Sallis Benny, Principal from 1934-58. From there, students can relax and enjoy pleasing views of the park-like courtyard through the new colonnade. 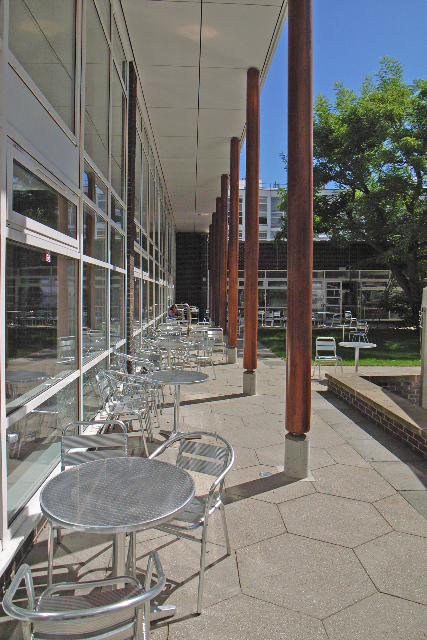 A remarkably sustainable material, coppiced sweet chestnut, was the material used for the colonnade’s pillars. New bricks to match the existing were quarried locally (near Crawley). Lime was used in the mortar instead of cement. Brighton’s great art school has been modified many times since the 1960s – but never with such emphasis on environmental responsibility. 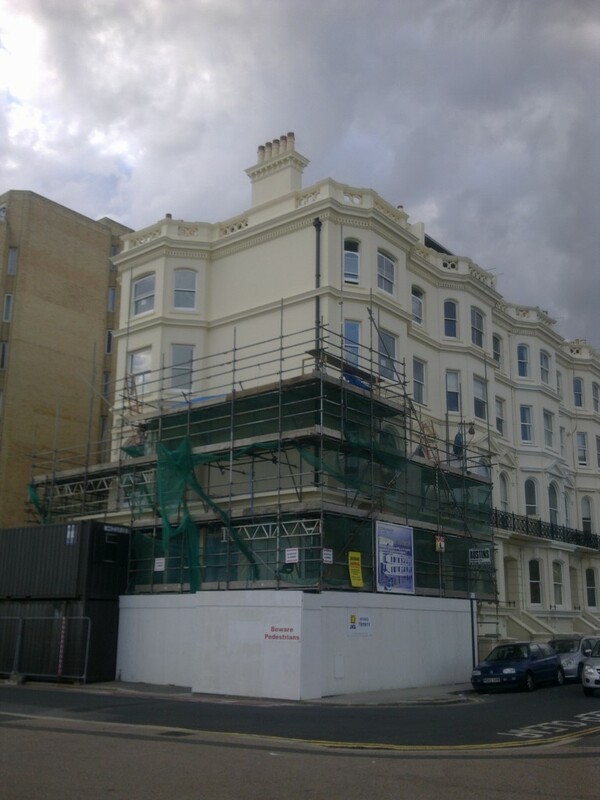 It’s no secret that Pink Floyd guitarist David Gilmour is in the process of restoring one of Hove’s most desirable seafront homes – 8 Medina Terrace. And I was lucky enough to be given a roof to basement tour by project consultant Neil England. Medina Terrace dates from the 1870s and No. 8 consists of six storeys in total. It is Grade II listed and situated within the Cliftonville Conservation Area on an enviable corner plot extremely close to the sea. The building was previously home to Karron Eubank, ex-wife of boxer Chris. Neil and I began at the very top of the scaffolding which surrounded the entire structure at that time. On the way up, I noticed an interesting detail. Most of the spindles on the staircase are wooden but, at strategic points, an equivalent metal item has been used in order to add strength. Chimney stacks were being constructed during my visit which included the installation of brand new replica pots that had been fabricated at £400 apiece. No expense is being spared in getting this project right. I first met Neil when he built me a chimney at Osborne Villas around the corner and we now serve on the committee of the Regency Society together. On this particular project he is working with architect Ewan Stoddart from LCE (of Jubilee Library fame) along with building contractor John C. Lillywhite Ltd. The airy top floor within the roof space opens out onto a terrace with views towards Worthing, Brighton and the South Downs. The roof itself is covered with Welsh slate, zinc and lead. Lightning conductors (necessary in such an exposed position) have been fitted to the chimneys and an array of solar panels sits on the highest point of the roof. The balustrades around the building have been reconstructed which gave Neil an opportunity to explain how hydraulic lime concrete was used. Lime, as opposed to cement, is used throughout the building though there is cement in the render. 8 Medina Terrace was once home to Captain and Mrs O’Shea (known as ‘Kitty’) whose troubled relationship made the headlines during the 1880s. Whilst separated from her husband, Mrs O’Shea began an affair with Charles Stewart Parnell, a hugely influential figure in Ireland. It was alleged that Parnell escaped down a rope ladder from a balcony on 8 Medina Terrace to avoid Captain O’Shea who had returned home unexpectedly. When I say that one could write a whole book on Florence, it’s really not necessary to quantify the statement. I mentioned to friends that I was off to visit that beautiful Tuscan city and seven different guidebooks came my way (and that’s on top of my own collection). The architectural headlines of the city are the Ponte Vecchio (‘old bridge’) and the domed cathedral (il Duomo). Cultural treats include several world-class art galleries and the Galleria dell’Accademia which houses Michaelangelo’s David. For me, the interesting bits were different entirely. In reality, Florence looks nothing like it does in the tourist guides. Typical photos of the city show acres of red clay roofs but as the buildings are tall and the pavements narrow, these delightful expanses are rarely glimpsed. At least the city is blessed with a number of unique features at eye level. The first quirky difference with England that I noticed might bore many but it’s worth a mention nevertheless. Locally, our drainpipes either vanish under the ground at the fronts of buildings or allow water to gush out onto pavements or into small drains. In Florence, they travel down the fronts of buildings as one would expect and then, just below first floor level, disappear into the façade, never to be seen again. I tend not to be bowled over by palaces and cathedrals; the small details all around are much more exciting. 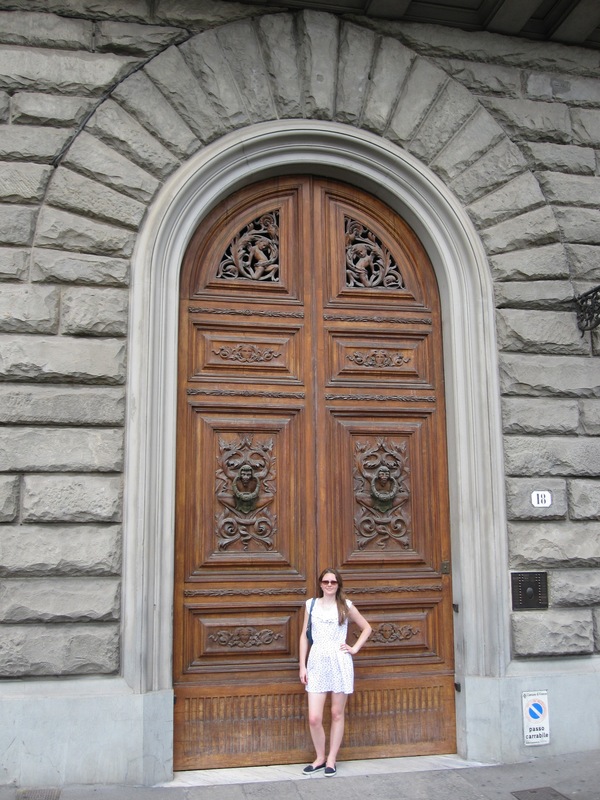 The pairs of huge fortified wooden doors at the entrances of most buildings in the centre of Florence are one such (not so small!) example. Countless arrays of brass doorbells characterise the streetscape too. 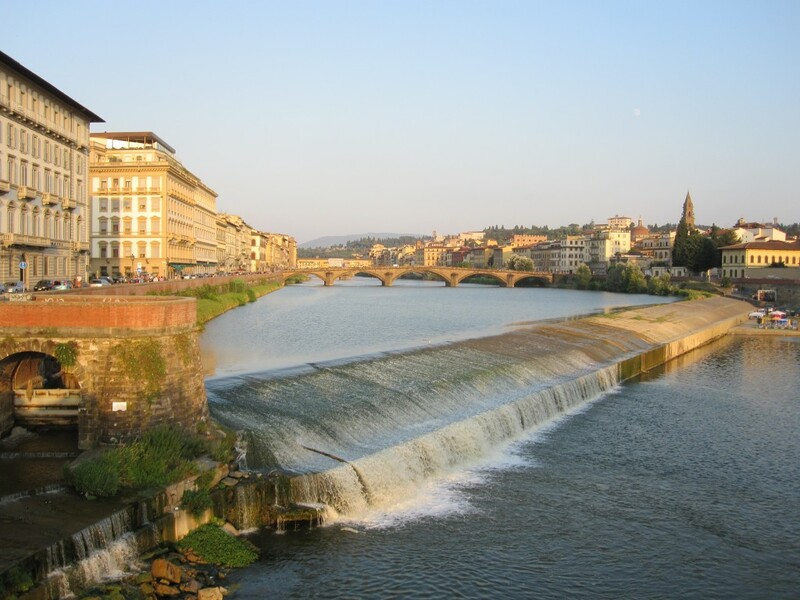 The River Arno flows through Florence and is very different to most other rivers with which I am familiar. Presumably its various weirs give depth to each section as the river changes level in its path down from the mountains. But only a trickle passed over each barricade which appeared to contradict the need for such high banks. I later discovered that the river goes from one extreme to the other (and in 1996 a devastating flood led to many deaths and the destruction of ancient works of art). I should thank my friend Julia Burdet for lending me her unique flat in the heart of Florence. Situated in an ancient guild tower with extravagant ceilings (and the biggest bathroom that I’ve ever used), the apartment couldn’t have been better. Having written well over 250 columns for Latest Homes on our local heritage, it’s always satisfying to find a completely new place or building to investigate. I have been to a number of funerals in the Lewes Road area over the years but, unsurprisingly perhaps, I hadn’t been there in a frame of mind to think about local history. But, after writing about Rose Collis’s New Encyclopaedia of Brighton, I met up with her for a tour of the Extra-Mural Cemetery. The term ‘Lewes Road cemeteries’ in my mind refers collectively to the Extra-Mural Cemetery, Woodvale Cemetery, Bear Road Cemetery, Woodvale Crematorium and the Downs Crematorium (of 1850, 1857, 1868, 1930 and 1941 respectively). Although the Extra-Mural Cemetery has its own entrance from the Lewes Road, the tour began at the foot of Woodvale’s idyllic driveway. A sharp left turn up a steep flight of steps then took us into the Extra-Mural Cemetery. Incidentally, ‘Extra-Mural’ is Latin for ‘outside the walls’ and refers to the cemetery’s location outside the boundary of early Brighton. The first grave of particular interest that I saw was that of Sir James Knowles, the architect responsible for the building known as King’s House, the home of Brighton & Hove City Council (originally a terrace of seven immense townhouses in fact). It is marked by a simple stone tablet on the cemetery wall. 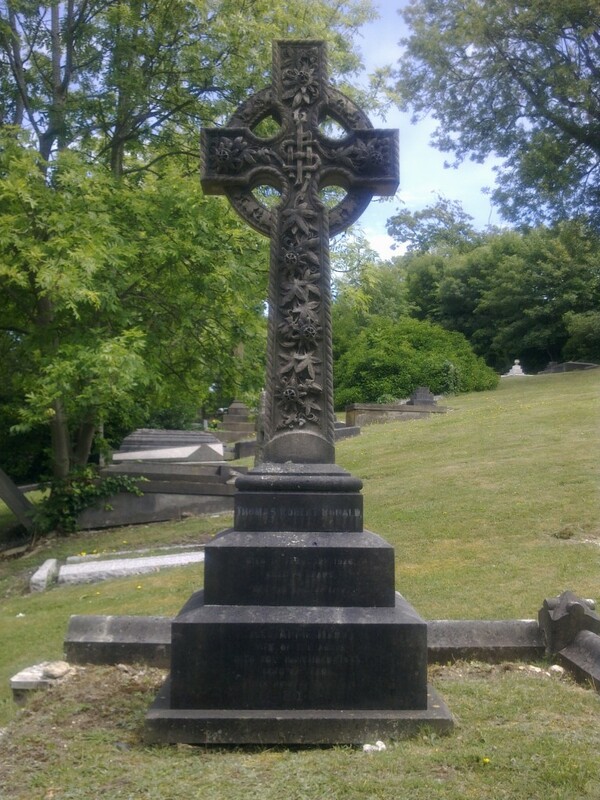 My guest, Kerry Underhill, then stumbled across the tomb of her great-great-grandfather, Thomas Robert Ronald, who lived at Elms Lea (an elegant mansion in Withdean which was demolished to make way for the current houses of Elms Lea Avenue). Other notable occupants of the Extra-Mural Cemetery are former mayors Sir John Cordy Burrows (see his statue on the Old Steine) and Dorothy Stringer, explorer Edward Bransfield, Reverend Arthur Wagner, Reverend Hendy Wagner and rail engineer John Urpeth Rastrick. There are so many more though. 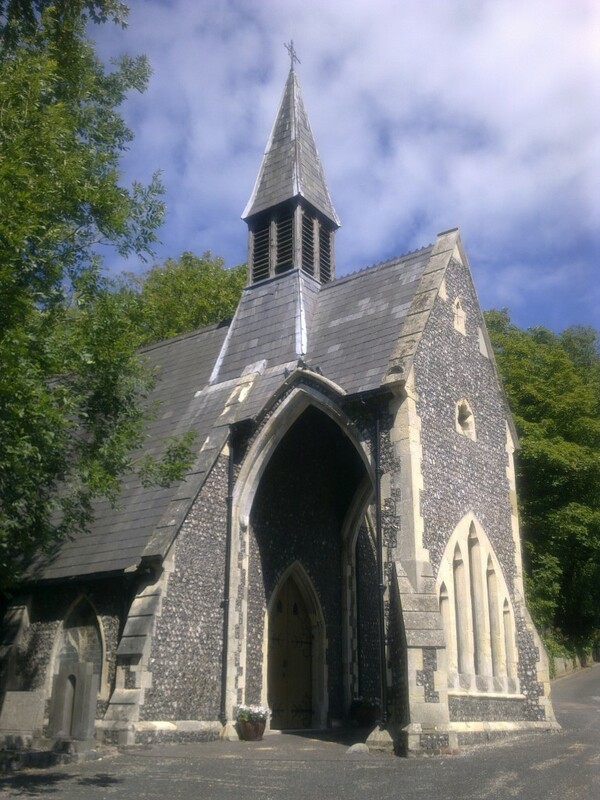 It also contains a number of Grade II Listed structures including the Ray and Ford mausoleums. The Extra-Mural Cemetery, in particular, needs friends and Rose is keen to get something set up. So many are connected in some way to this delightful place – please get in touch with Rose at rose.collis@sky.com to get involved.